Schedule twice-a-week, weekly, or bi-weekly visits with your chef. No long-term commitment required. Our professional chefs bring fresh ingredients and cook delicious, homemade meals in your kitchen. You're set for the week! We leave you with customized, nutritious meals that can be eaten at your convenience. A native Houstonian and proud University of Texas Longhorn, Shonah Jefferson began her culinary career at the tender age of 11 – helping her dad at his local Houston restaurant. After spending many years in business and as a practicing attorney, she returned to her culinary roots by managing the family restaurant for a few years while obtaining a degree in Culinary Arts from San Jacinto College. 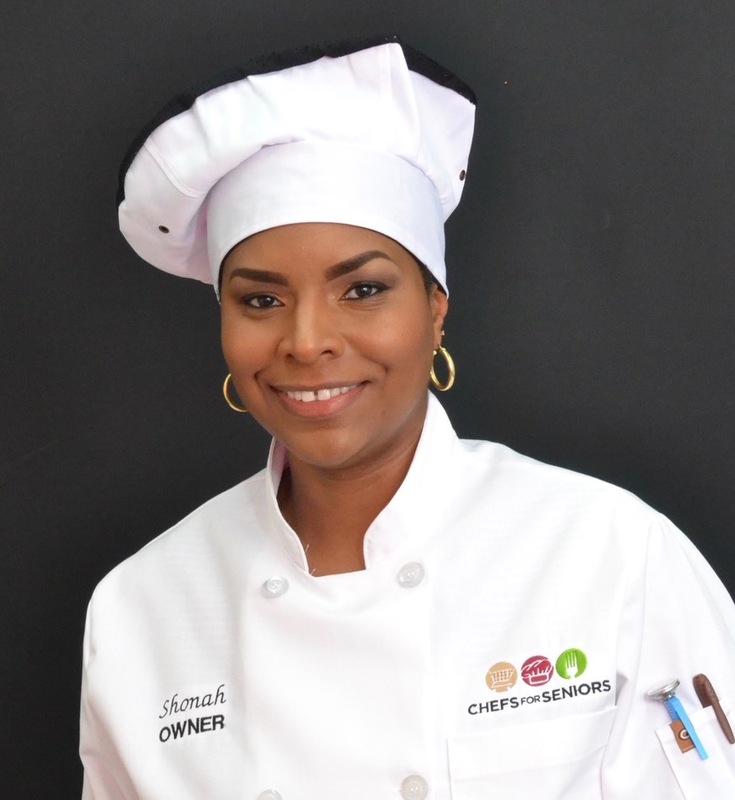 Shonah has always had an interest in giving back to others because “to whom much is given, much is required.” Being a Chefs for Seniors owner and personal chef gives her an opportunity to “do well by doing good” and to combine her love of people, business and the culinary arts. She looks forward to serving the seniors of the North Houston area for many years to come. Nutritious meals. Fresh and delicious tasting food. Convenience. Customized menus. Companionship. Peace of mind. There are many reasons why customers choose Chefs For Seniors - North Houston. Watch this video to learn more. SAMPLE MENU ITEMS FOR clients in the North Houston Area! Surprise a friend or loved one with customized, chef prepared meals. Virtual gift cards can be purchased for a variety of amounts. Gift cards for this location are valid for use in the North Houston area. + What does the service cost? The price of our services are region-specific and depends on your individual needs. Our goal is to provide an affordable solution that seniors can use long-term. For example, in Madison, WI where the company was founded we have clients that've enjoyed chef-prepared meals every week for 6+ years. We offer three different service packages to meet a variety of needs: Standard, Custom, and Non-Standard. Click HERE to request more information on pricing in your area. The Standard Package: your chef prepares 10-12 individually packaged servings of meals during a 2-hour home visit, depending on the items ordered. Select from our weekly menu rotation, with the ability to modify the dishes to meet your dietary needs and food preferences. The price of the Standard Package starts at $99 for grocery shopping, menu planning, and meal preparation. Contact your local franchise owner for specific pricing information in your area. 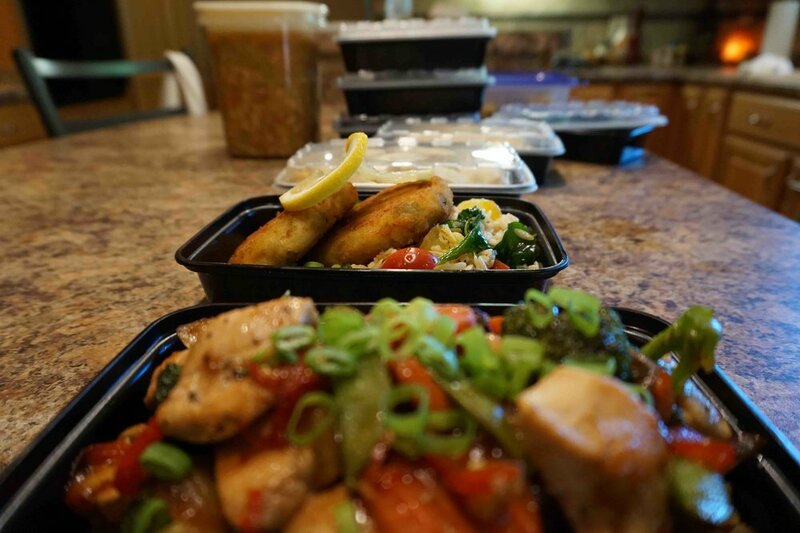 The Custom Package: the chef prepares 10-12 individually packaged servings of meals. Custom Package clients are able to have more control over their menu, and the chef can even utilize dietary information from your doctor or dietitian. There is an additional $10-$20 surcharge for the Custom Package depending on the scope of your dietary needs. Non-Standard Package: this covers basically everything else. If you need the chef to cook for 3+ people, prepare food for a dinner party, or want help with holiday meal prep that’s what the Non-Standard Package is intended for. The price for Non-Standard services depends on the nature of the job, and local franchises charge an hourly rate for the chef's time. + How many meals will the chef make? During a 2-hour home visit, your personal chef will prepare 4 different entrées and 10-12 individually-packaged servings of meals. The exact number of servings depending on your appetite and the types of meals ordered, and serving sizes can be adjusted with your chef. + How often does the chef come to my home? Most clients have their personal chef visit their home every week, although some choose to schedule services every 2 weeks or 2x per week. We can work within your budget, appetite, and needs. + Do I have to be home while the chef is cooking? Your don't have to be home during the chef's visit, although most clients enjoy chatting with their chef. Arrangements can easily be made for the chef to cook while you're not home, as long as they have access to the kitchen. + Can meals be delivered? The primary benefits of our service are the level of customization offered by having your own chef prepare meals just for you and the unique experience during a service day. Our model allows us to accommodate a variety dietary concerns and unique food preferences. When you experience a chef visit for yourself it’ll be something you look forward to every week! + What if I have a special diet or dietary concerns? We can accommodate most dietary concerns and diets. Our chefs and menus are particularly well-suited for low-sodium, diabetic friendly, gluten-free, Kosher, and renal diet meals. We also take inspiration from the DASH Diet (Dietary Approach To Stopping Hypertension), when designing our weekly menu rotations. Our Custom Package is well suited for clients with less common diets or dietary concerns. + Will they clean the kitchen when they're done? We ask that your kitchen is clean when your chef arrives. Our chefs take pride in cleaning the kitchen thoroughly once they’ve completed the cooking. + Do I have to supply the cooking equipment? Your chef will bring their own “toolbox” with pots, pans, knives, and utensils into the home. You don’t need to have anything on hand except an appetite and working appliances! + If I’m interested, what’s the next step? Contact us at the bottom of this website page or give us a call to set up a free, no obligation consultation with a local chef. LESS EXPENSIVE AND HEALTHIER THAN EATING OUT. REQUEST MORE INFORMATION AND RECEIVE AN ESTIMATE. FULLY LICENSED, VETTED, AND INSURED "CHEFS WHO CARE"
FILL OUT THE FORM BELOW TO REQUEST A FREE, NO OBLIGATION CONSULTATION AND RECEIVE MORE INFORMATION, INCLUDING A COST ESTIMATE. OR, GIVE US A CALL AT 832.956.1848. Thank you for your information! We will be in touch with you soon to schedule a free, no obligation consultation.